This document details how to configure a pre-built version of MapServer to run on IIS (Microsoft’s web server - Internet Information Services). These steps have a minimum requirement of IIS 7 and Windows 7, and should work for all release since up to IIS 10 and Windows 10. MapServer can also be run on Windows using MS4W (MapServer for Windows) - which installs its own preconfigured Apache web server, and other related tools such as PHP, TinyOWS, and MapCache (which doesn’t currently run under IIS). Running MapServer under IIS may be necessary when deploying to servers where the installation of an additional web server is restricted, or where system administrators have more experience maintaining IIS. The MapServer executables from MS4W can also be used under IIS as well; for more information see the section in MS4W’s README, or ask the MS4W community for assistance (subscribe). Precompiled versions of MapServer and GDAL (a required dependency) can be downloaded from http://www.gisinternals.com/release.php. These downloads are built and maintained by Tamas Szekeres a long term contributor to MapServer, and Project Steering Committee (PSC) member. Unless you are using deprecated features in your Mapfiles you should download the latest stable release. Nearly all servers will now have a x64 (64-bit) architecture, so unless you are restricted to a win32 (32-bit) server download a x64 release. Unless you have a good reason you should use the latest compiler version. MSVC 2013 means the binaries were compiled with using Visual C++ 2013. If you rely on Python2 Mapscript you will need to use the MSVC 2008 version so that it matches the version Python2 was compiled with. 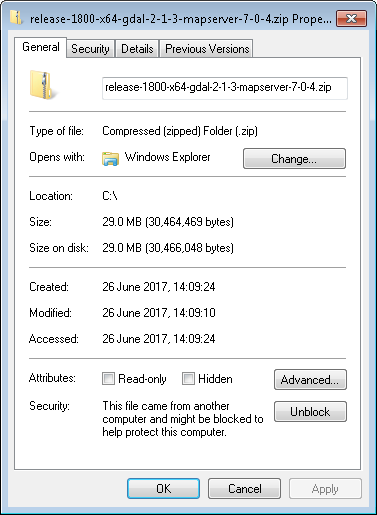 This installation guide uses the “Compiled binaries in a single .zip package” download (release-1800-x64-gdal-2-1-3-mapserver-7-0-4). There is also a “MapServer installer with IIS registration support” option but at the time of writing this did not install successfully. Once you have downloaded the zip file follow the steps below. Unzip the folder to your machine. In this example we will assume it has been unzipped to C:\MapServer. Make sure that have “unblocked” the zip, to avoid and security related issues later. Right-click on the zip file, select properties and click the “Unblock” button on the General tab. The MapServer version and supported format types should be displayed in the command window. These steps assume IIS 7 or higher is installed on the development machine, and MapServer will use the default website location at C:\Inetpub\wwwroot. All command line steps should be “Run as Administrator” (to select this option this right-click on the Windows command line icon). 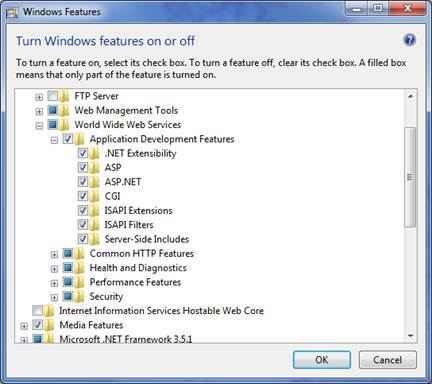 Make sure IIS is on the machine - if you have a folder named C:\Inetpub then it is likely IIS is already installed. "%systemroot%\system32\inetsrv\appcmd" add app /site.name:"Default Web Site" /path:/mapserver /physicalPath:"C:\Inetpub\wwwroot\mapserver"
"%systemroot%\system32\inetsrv\appcmd" set config /section:isapiCgiRestriction /+"[path='C:\MapServer\bin\mapserv.exe',description='MapServer',allowed='True']"
Test the setup was successful by entering the following URL in a browser: http://localhost/mapserver/. If the following text is displayed then MapServer has been successfully configured as a FastCGI application in IIS. MapServer applications consist of a Mapfile, and additional optional files for data, symbols, logs, and images. The same instance of MapServer can be used to serve many applications. In this example we will create a new test subfolder for a test application in a C:\MapServer\apps folder. Now create a new test.map file in this folder and paste in the test Mapfile below. You can setup MapServer logging by adding the following lines to your MAP block. If a different application pool is used, or you don’t set the permissions you will receive the following message (also check that the C:\MapServer\apps\test\logs folder exists as it will not be created automatically). Check that the file exists if you receive the following error. If it does exist then check the file permissions. MapServer projections are stored in C:\MapServer\bin\proj\SHARE. When the projection is specified in the following form "init=epsg:3857", MapServer will try to find this code in the epsg file, where it is listed as <3857> +proj=merc +a=6378137.... If you receive the error below then make sure the CONFIG "PROJ_LIB" "C:\MapServer\bin\proj\SHARE" setting is pointing to the correct path. Note on one installation this message was shown as forward slashes rather than backslashes were used. msProcessProjection(): Projection library error. proj error "No such file or directory" for "init=epsg:3857"
The following error is caused if IIS has been locked-down so settings cannot be overridden at the web.config level. This configuration section cannot be used at this path. This happens when the section is locked at a parent level. overrideMode="Deny" or the legacy allowOverride="false". Check C:\MapServer\bin\mapserv.exe exists if you encounter the error below.